On the evening of May 20, over 80 individuals which included guests, speakers, sponsors, members and an external panel of judges joined together to participate in the final two steps of NAWBO Central Jersey’s 6th business plan competition known as Supporting Emerging Entrepreneurs’ Development [SEED]. 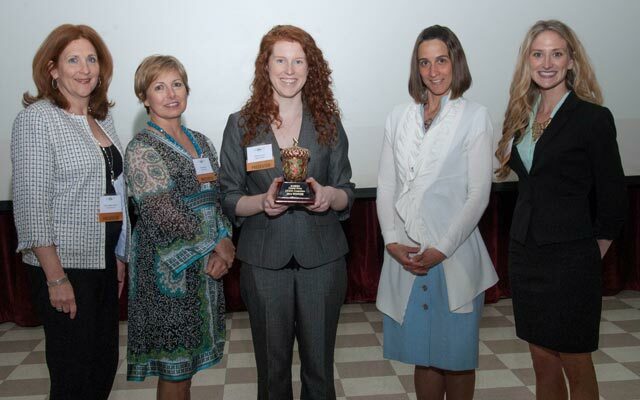 The competition was sponsored by the National Association of Women Business Owners – Central Jersey Chapter in collaboration with Rutgers University’s New Ventures and Entrepreneurship group. Any New Jersey-based business at least 50% woman-owned and less than two years old were eligible to enter. Provide an executive summary that describes your business. Who is your target market or ideal customer and how do you plan to reach them? What sets your business apart from other businesses in your industry? What skills or experience do you bring to the business? Summarize the financial needs of your business and how you will meet them. Five finalists were chosen from a panel of external Judges from Rutgers University, Brookdale College, and The Intersect Fund. The Judges were chosen for their experience and expertise in entrepreneurship. On the evening of the event, Finalists set up a display describing their business and answered questions from the guests. Dinner was followed by a 3-minute presentation to the audience. Every one of the Finalists was clearly passionate about her business and its opportunity for success. The audience was then invited to vote by secret ballot while the judges completed their ballots based on the exhibits and the presentations. Bioengineer and medical student at Robert Woods Johnson School of Medicine, Kimberly Lynch, was declared the winner. LaparoClean, designs and markets a sheath to cover a laproscope during surgery so that the view remains clear to the surgeon reducing the need for it to be taken out for cleaning and reinsertion into the patient. This reduces the time for surgery as well as lessening the chance of infection. Kimberly received over $15,000 in prizes, gift cards, and services from NAWBO members, local and national sponsors, and Rutgers University. For more information about the mission and goals of NAWBO-Central Jersey, we encourage you to visit our website at www.nawbocentraljersey.org. Founded in 1975, the National Association of Women Business Owners (NAWBO) is the unified voice of America’s more than 10 million women-owned businesses representing the fastest growing segment of the economy. NAWBO – Central Jersey is the place where women business owners connect, build strong relationships that foster business growth, develop valuable leadership skills, and gain knowledge and insight from experienced owners. Rutgers Office of New Ventures & Entrepreneurship (NVE) is dedicated to advancing commercialization of Rutgers intellectual property via the creation of start‐up companies and other entrepreneurial initiatives; promoting entrepreneurship and facilitating entrepreneurship activities within the Rutgers community; and nurturing an innovation ecosystem around the university and beyond. More than 100 start-up companies have been created based on Rutgers technologies; two thirds are New Jersey-based. Have our inspiring stories sent to your inbox each month. There are many great articles in past issues. Read older issues (2012 and earlier) here. Linking Women to Resources at the Jersey Shore. Text, photos, graphics, and HTML code are protected by US and International Copyright Laws, and may not be copied, reprinted, published, translated, hosted, or otherwise distributed by any means without explicit permission.